1. Press and hold 1/2 button until the Shock digit on the Display flashes, and then Press"+/-" button on the side to adjust Shock Level from 1-16. 2. Press and hold 1/2 button until the Vibration digit on the Display flashes, and then Press"+/-" button on the side to adjust Vibration Level from 1-8. The remote transmitter does not have a switch button. When it is out of power, it will automatically shut down and automatically start up after charging. In this mode, pressing any button will cause the receiver to execute the command and activate the display. ★【Safe & Humane Training Modes】-2 dog training collars all offer Static Shock (1-16), Vibration(1-8) levels and a standard "Beep" mode.Using the "1/2" button to switch dogs and change vibration & Shock level. Training 2 dogs with one remote will be more convenient for the people who have many dogs. 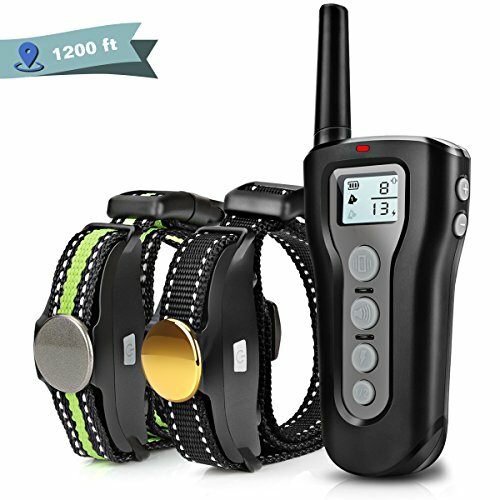 ★【100% Waterproof & 1000 ft Remote Range】-100% Waterproof collar can be used in shower,swimming, pool and the rain. With new signal transmission technology, the remote control reach up to 1,200 ft.Training your dog in the park, backyard or anywhere else. ★【Fast Rechargeable & Durable】-The remote and receivers can be charged simultaneously. After 2-hour rapid charging ,the collar use 15 days and the remote use 60 days. It provides a long lasting battery life and saving the cost of purchasing batteries.There are two pair of conductive silicones to protect pet's skin from directly contacting the metal. ★【Ergonomic Design & Adjustable collar strap】-Blind operation and anti-stuck buttons are the so special design. You can send out the different training commands through different separate command buttons. Two straps are soft, adjustable and won't irritat or bother them.It fits dogs from 10 lbs and larger. A collar size from 10 to 25 inches. ★【Effective & 3 YEARS Warranty】Using our professional training collar will better help you train the dog correct barking, siting, walking and other behaviors. 3 YEARS Replacement or Refund Warranty. If you have any questions about this product by Boniten, contact us by completing and submitting the form below. If you are looking for a specif part number, please include it with your message.